Innovation seems to be a prime directive at almost any firm I run into, regardless of industry. How do you get more of it? In these tough times the answer is no longer to throw money at it. What we increasingly need is frugal innovation, what the Indians call Jugaad. It is an idea, whose time has come. Earlier this year I had the pleasure of traveling to India with 30 McGill MBA and B.Com. students to meet with executives of a number of large companies in New Delhi, Mumbai, and Bangalore as part of the ongoing Hot Cities of the World Tour. The word Jugaad turned out to be the word of the trip. A word that I believe should be adopted by many firms in the West. We first ran into the word in London enroute to Delhi. What would have otherwise been an unfortunate 15 hour layover at Heathrow on the way to India, was made quite enjoyable thanks to a few activities in London, including a visit to the offices of The Economist. We sat down with Adrian Wooldridge, Management Editor and Schumpeter Columnist, who had just returned from India and was glad to share some of his thoughts with us. One of the hot topics: frugal innovation, the essence of which is captured by the Jugaad mindset, a Hindi word that in a nutshell refers to making do with what one has to solve one’s problems (also implying a certain degree of improvisation). In a business context it means bringing innovative products to market despite limited resources – if not thanks to limited resources, since it is the financial constraints of producers or customers (or both) that drive the innovation in the first place. Frugal innovation results in great value: no-frills, good quality, functional products that are also affordable to the customer with modest means. If you want to hear more of what Adrian said about frugal innovation, listen to the youtube video below. It is only a recording, there is nothing to watch due to technical problems. Throughout the trip’s many discussions three examples of frugal innovation stood out. One that everyone has heard of is the Nano, unveiled by Tata Motors in 2008, which now retails for just over US$ 3,000. Equipped with only the bare essentials, the car is mainly aimed at the domestic market where it is not uncommon to see a family of four crowd onto a motorcycle or scooter. Though it is still too early to say whether the Nano will truly become “The People’s Car”, we were told that it problems with working on really hot days, it nonetheless provides a good example of frugal engineering. New low-cost technology in healthcare also has everyone talking. For instance, GE, which operates tech centers in Hyderabad and Bangalore, has introduced breakthrough items such as an electrocardiogram in a backpack and a computer-based portable ultrasound machine. They sell for only US$ 1,000 and $15,000 respectively (fractions of the usual prices for those devices) and are said to have the potential to revolutionize access to healthcare in developing countries. These products are now also being sold in the US. Interestingly enough, frugal innovation reverses the historical notion that multinationals innovate in rich countries in order to sell their products in poor countries. Hats off to the late C.K. Prahalad and his book, The Fortune At the Bottom of the Pyramid. The concept of Jugaad, however, is not just about developing new technology. In fact, we witnessed firsthand the work of the Dabbawalas in Mumbai who demonstrated exactly that. The business model is simple: Dabbawalas collect freshly cooked meals in boxes from the homes of Mumbai residents and deliver them to the workplace for a (very) modest monthly fee (Dabbawala means “one who carries a box” in Marathi). What is not so simple is the delivery process. 5,000 Dabbawalas deliver 200,000 boxes per day using only bicycles and various modes of public transportation. Their supply chain is made up of a complex series of collection zones, sorting points, and delivery zones, supported only by an elaborate manual coding system. The codes are made up of only numbers and colors because 50% of the employees are illiterate. The only modern technology used in the process is are a website and a text message receiving system which allow customers to request deliveries in real time.Forbes Magazine awarded its Six Sigma certification in 2001 to the Dabbawalas based on a 99.999999 percent delivery accuracy rate (1 error for every 16 million transactions). We spent over an hour at one of the sorting points observing the Dabbawalas, doing our best not to get in the way of the constant exchanges of packets between bicycles, a sort of controlled chaos (which we came to learn describes much of Indian city life). We recounted a few lessons that we took away from the experience. For one, frugal innovation goes beyond clever R&D. It has a lot to do with process – in this case, maximizing the efficiency of the supply chain. Second, sometimes less is indeed more. No fuel, no capital investment, almost no modern technology, and yet a high quality of service: that’s frugality at its best. And third, the circumstances of the operating environment matter a great deal when it comes to frugal innovation. One of the main reasons the Dabbawalas are so successful in Mumbai but haven’t yet expanded to other cities is that their system is built on a combination of characteristics that is unique to Mumbai. A few days in Bangalore and Mysore allowed us to spend some time with two companies that are at the other end of the tech spectrum: Wipro and Infosys, two of India’s top IT companies. At Wipro, much of the discussion centered around cloud computing which, I must admit, was a indeed a little cloudy prior to this informative session. Cloud computing is frugal because it eliminates the need for expensive local storage on computers, and optimizes the use of remote data servers due to scale advantages. But how is frugal innovation sustained? A tour of Infosys’s spectacular 335-acre campus in Mysore and a visit to its Leadership Institute made it clear to us that the company doesn’t leave that up to chance. Gone are the days when Indian IT companies could rely on their access to cheap labor to compete on price with foreign multinationals – the fact that IBM is now the second largest private sector employer in India is just one example of why. So the differentiating factor is quality of service, which must be upheld by constant innovation. Much of Infosys’ ability to continually innovate can be attributed to its emphasis on recruitment and training. The campus in Mysore alone produces 10,000 graduates every year while grooming another 500+ employees, chosen from offices around the world, to eventually hold senior leadership positions. Infosys has grown from 7 employees and US$ 250 in 1981 to a truly global company with over 130,000 employees and a market cap of over $US 35B today, so there must be something about its model that works. How do we use frugal innovation back here in the West? Actually, I think we are doing a lot of it now but given where our economies are I believe we need to use it more. With one big airline that I am working with I am encouraging senior managers to adopt this approach. The airline industry today simply does not have money to throw after their problems, if it ever did. There is still room for CEO led big hunkin’ transformational change. But I think the dominate route to corporate transformation is to allow a 1,000 flowers to bloom, fertilize the best and then when they have proven themselves in pilots, scale them up and spread the key few winning innovations across the organization. This connects middle managers that are close to the customers and the day-to-day work of the airline with the real business problems of today’s airline industry. As middle managers they have credibility and access to the senior executives who, correctly, control the purse strings. In my mind,Jugaad is a concept that appears to work in India and back here in the West. This column was with written with a great deal of input from two McGill students who joined me on the trip to India this year, Veronica Dasovich from St. Paul, MN, one of our many wonderful U.S. students at McGill and Daniel Novak, a native Montrealer. 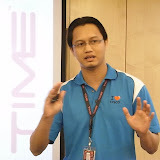 I conducted a 1-day presentation skills program for Time dotcom on 2 may, 2011. The training was conducted at Selangor hrdc in worldwide business centre. There were 9 participants in the program and i am happy to see the results.